Sure, you could pay for cloud services, but with GlusterFS, you can take the idle space in your own data center and create a large data warehouse quickly and easily. GlusterFS combines the unused storage space on multiple servers to create a single, large, virtual drive that you can mount like a legacy filesystem – using NFS or FUSE on a client PC. And, you can add more servers or remove existing servers from the storage pool on the fly. 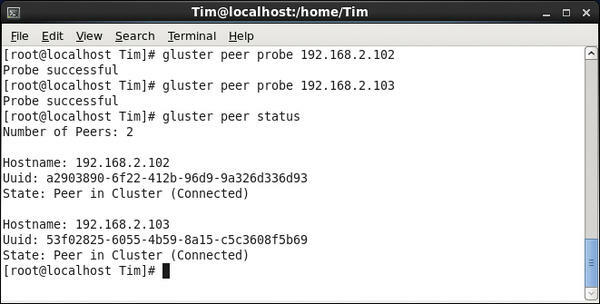 GlusterFS works kind of like “RAID on the network,” and if you look closely, you will discover many RAID concepts during setup. GlusterFS really comes into its own when you need to store huge quantities of data, have redundant file storage, or write data very quickly for later access. GlusterFS can juggle multiple petabytes easily, and it’s easy to install and manage. Theoretically, data throughput increases with each server you add, although the network connection also imposes limits. GlusterFS can use both TCP/IP connections and InfiniBand RDMA. Whether just one or several thousand clients are attached to the wire at the same time makes no difference. GlusterFS is equally well suited for small or large networks, and it will distribute your payload and metadata across all your servers in an intelligent way, thus making it error tolerant and highly available. GlusterFS itself goes back a couple of years: Development started in 2005 with Gluster Inc. At that time, the developers placed the source code under the GNU GPL and mainly earned money on commercial support. At the end of 2011, Red Hat acquired the distributed filesystem for several million US dollars and thus pushed it into the limelight . Initially, the sales model didn’t change. The current GlusterFS versions, on the basis of which Red Hat has compiled some of its commercial products in its cloud computing division, are licensed under the GPL v3. To show how fast and easy it is to set up GlusterFS, I’ll use a simple example. On a small network with Gigabit Ethernet, three servers provide hard disk capacity, and a client wants to use them (Figure 1). 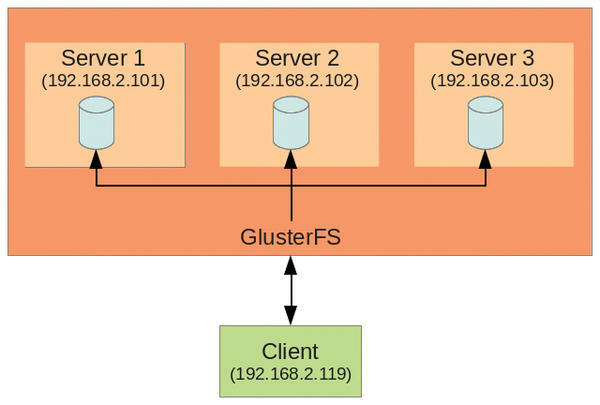 Figure 1: The lab setup has three servers; GlusterFS bundles their storage and serves it up to a client. GlusterFS requires at least 1GB of RAM in the servers, 8GB of free space on the disk, at least Gigabit Ethernet, and a 64-bit version of Linux. For GlusterFS 3.2.5, which was the latest version at press time, the developers recommend Red Hat Enterprise Linux 6.1 because it has undergone the most testing. A cheaper alternative is available in the form of the free counterpart to Red Hat, CentOS; you should have a fresh installation of CentOS on all of the computers you use to follow this example. The installation and setup works in exactly the same way on other distributions (see the “GlusterFS Abroad” box). Typing glusterfs -V tells you whether or not the installation worked. Each server gives one of its directories (referred to as a “brick”) into the care of GlusterFS, which combines multiple bricks to create a large data repository. The volume, in turn, is mounted by the clients like a drive. For this to happen and for the individual servers to exchange information, you need to open the matching ports on the servers. To be precise, these are UDP port 111; TCP ports 111, 24007, 24008; and an additional port for each brick starting from 24009. If you want to use NFS on the clients later to access the data storage, you also need to open the ports starting with 38465 – again, you need one port for each server (see Figure 2). 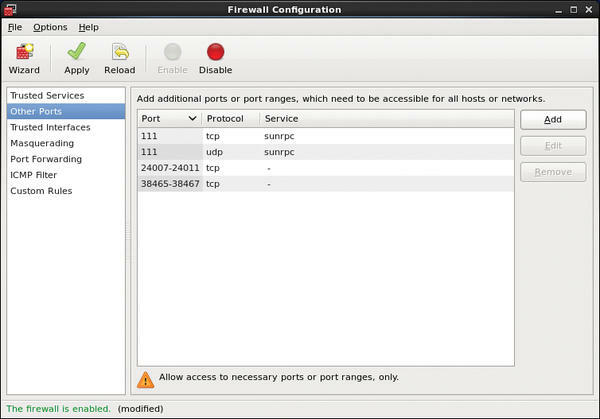 Figure 2: The example firewall configuration in CentOS. These commands open up the ports for three bricks and three servers, which will be perfect for this example. The installation scripts in the packages have already ensured that the server is started at boot time. Instead of using the IP addresses, you can use the hostnames. These three computers now form a Trusted Storage Pool (Figure 3). Figure 3: The Trusted Storage Pool comprises three computers; the local computer is not listed. will remove it from the Trusted Storage Pool. Incidentally, the gluster tool is formally referred to as the Gluster Management Console. In contrast to the older versions of GlusterFS, you no longer need to edit the configuration file directly, thanks to the console. If you prefer to do some manual editing, you can open the /etc/glusterfs/glusterfsd.vol file. In the same directory, you will find a nicely commented sample configuration, glusterfs.vol.sample, which, with the help of the information in this article, should be easy to understand. Speaking of configuration: All servers in the storage pool automatically synchronize their configuration, so they are always up to date. The next step is to tell GlusterFS which directories (a.k.a. bricks) it should combine on the individual servers to create a new large volume. In this example, I am using the /data directory on each server, which GlusterFS can now access for its own purposes. According to Red Hat, the filesystem of choice is XFS, but GlusterFS will also work with any other POSIX-compatible filesystem, such as ext3 or ext4. On one hand, these filesystems have had less testing; on the other hand, you might need to do without some GlusterFS features (e.g., Access Control Lists). This command lists all of the existing volumes and shows what they’re made of (Figure 4). Figure 4: The example volume is now complete. The clients can now mount the created volume. For this to happen, you first need to install the Gluster Native Client on the client side. It uses FUSE to mount the volume and, thus, runs totally in user space and is POSIX compliant. At first glance, this seems too good to be true, but with GlusterFS, any computer on the network can be a server and a client at the same time. This means that any computer on the network could hand over a part of its storage capacity to GlusterFS and then tap into the large storage pool – as long as you remember to open the appropriate ports on the client. Incidentally, it doesn’t matter which server you specify for the mount. The Gluster Native Client only retrieves the configuration from the server and then communicates autonomously with the servers involved. If you only see an error message, something must be wrong with your network configuration. 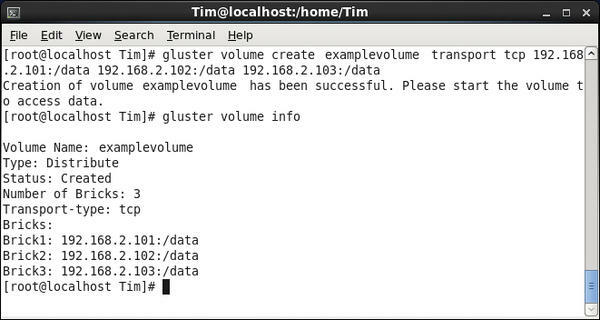 When the volume appears below /mnt/glusterfs, you can start to populate it with files. GlusterFS will distribute the files randomly across the individual bricks – in this case, across the /data directories on the three servers. You can verify this for yourself by logging into one of the servers and taking a look at the directory in question. This approach helps GlusterFS achieve very fast read and write speeds. Unfortunately, this method is anything but safe: If one of the servers fails, all of the data saved on that server is lost. 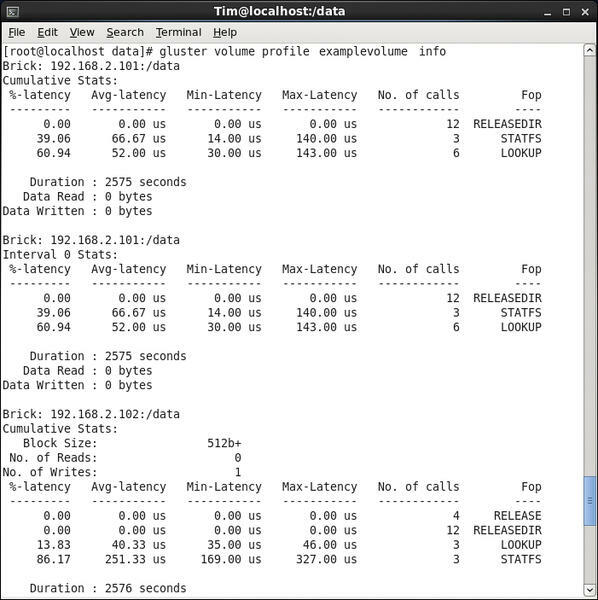 Luckily, GlusterFS can set up volumes other than as the distributed volumes that I have looked at so far. The replica 3 parameter tells GlusterFS to replicate the file to be saved exactly three times (here, that means storing a copy on each server). The GlusterFS developers recommend setting this value to the number of bricks, with the bricks preferably residing on different servers. each file exists exactly twice, each copy stored on one of the four servers. In other words, a Distributed Replicated Volume offers a compromise between data protection and speed. The replica values should always be set to a multiple of the existing bricks. To be quite sure that the replicated data really do end up on different servers, the create command should list the first bricks on each server, then the second bricks on each server, and so on. GlusterFS forms matching internal groups, or sub-volumes. The value following stripe should reflect the number of bricks. If this isn’t the case, you can create a Distributed Striped Volume, which spreads the file snippets over two or more bricks. The number of bricks should be a multiple of the stripe value. These two clients can still mount examplevolume, but they can’t access it. If you enlarge a Distributed Replicated or Distributed Striped volume, you need to add new bricks in a multiple of the replica or stripe value, or both (see the “Redundant Storage” section). which is useful if a hardware failure occurs. 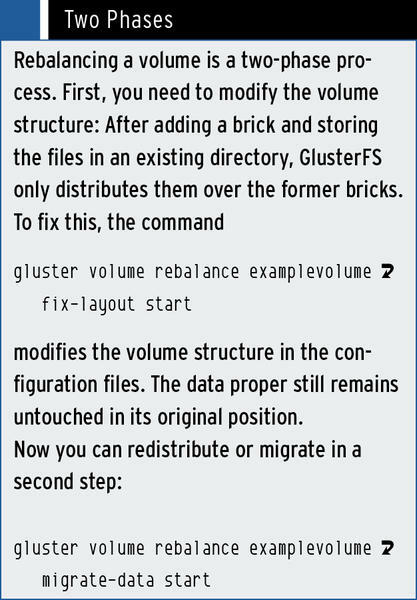 In that case, GlusterFS simply removes the brick from its configuration. The data stored on the affected brick remains where it is, although it is not accessible to the client. In the case of Distributed Replicated or Distributed Striped volumes, you again need to remove bricks in multiples of the replica or stripe value from the same group (see the “Redundant Storage” section). This command is actually only a shortcut for two other commands, which the “Two Phases” box introduces. If you then use the start command above, GlusterFS automatically continues where it left off, rather than restarting. Now you can remove the troublesome server 192.168.2.101 and repair it. to output statistics (Figure 5). Figure 5: The profile statistics keep you up to date with I/​O speed and thus with bottlenecks. GlusterFS can do even more. Geo-replication lets you mirror data on a volume across the wire. The target can be a single directory or another GlusterFS volume. The transmission can use a secure SSH tunnel if needed. Right now, GlusterFS only supports master-slave operations in which the GlusterFS source installation (the master) transfers its data to the slaves. Geo-replication is mainly intended for creating mirrors and backups.Additionally, you can restrict the space available to individual users on a volume or in individual directories – in other words, you can set up quotas. Finally, access to files and directories can be controlled with the use of POSIX Access Control Lists. As mentioned earlier, this assumes you have the right kind of filesystem on the bricks. GlusterFS also offers a REST-API. More features are on the roadmap for the future: According to Red Hat, it is currently investing heavily in GlusterFS development. The company is also looking to collaborate more closely with the community and thus establish GlusterFS as a standard for distributed storage in the long term. The distributed filesystem will form the basis of Red Hat and JBoss installations. The new version 3.3 of GlusterFS is already available as a beta version and will be released in 2012Q2 or Q3. The new version can act as a back end for Apache Hadoop and also supports Unified File and Object Storage for accessing stored data via an Amazon S3-compatible interface. If you are interested in more details on managing GlusterFS, check out the very good PDF manuals on the GlusterFS website. If you have questions, the community portal is definitely worth a visit.